Do you dread the treadmill? Bear it? Love-hate it? I dread and avoid it at all costs. But today the sky was dropping a gazillion inches of rain and the Weather Channel was flashing the red flood warning line, so dreadmill it was. 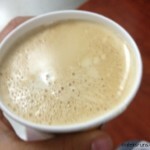 Latte from YMCA vending machine: $1. 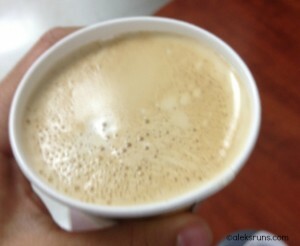 Organic beans; non-fat milk. What’s not to love? Warming up, I realized NBC was broadcasting Ironman World Championship: Kona again. Yesss! Aleks: 1. 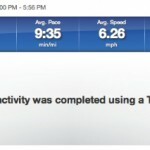 Dreadmill: 0! The machine needed to be reset only once (max time is 99 minutes, so that first pic you see there is 101 minutes, including 2 min cool down that I used to eat a GU). Slowed down the pace for the second part, then accidentally lassoed my iPhone behind me (I wonder why it keeps breaking…). Paused the machine to go get it, pressed Stop again by mistake and there; round 3. The final go was the slowest, including a seven-minute cool down walking at 4 mph/ 15-minute mile. I was possibly the first person to ever eat Twizzlers while working out? 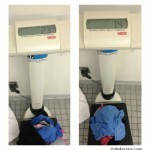 I did, too, weigh my soaked clothes in the locker room — then drained them and weighed them again. 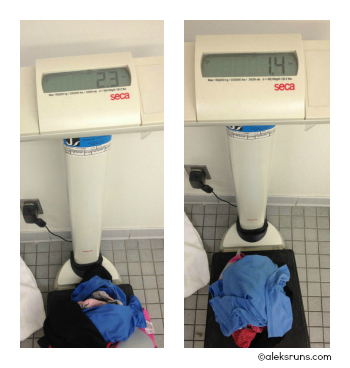 And yes, I know: I should’ve thought to weigh them when they were dry, pre-run. Next time! Mix up speed and incline to keep your mind occupied. If watching TV, pick up the pace during commercials. Put a towel over the display and try to guess how long and how far you’ve run without peaking. I don’t know… I was still bored. Now your turn. Do you run on treadmills? What’s your cure for boredom? UGH. The treadmill is my nemesis for sure and I have to contend with it these days because I’ve grown up to be a TOTAL WIMP about running outside in the cold. Yesterday, I swear the timer was stopped. That’s how bored I was. That’s how much I watch the clock. I’m going to have to try your Twizzler method. 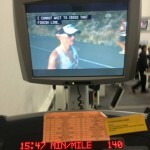 Anything to distract me from the dreadmill (great description!). 18 miles? Holy moly. I do run on treadmills because sometimes it’s cold out and I’m a wimp. 8 miles was my longest treadmill run and I thought that was freaking amazing/crazy. I bow to your 18 mile amazingness (new word). 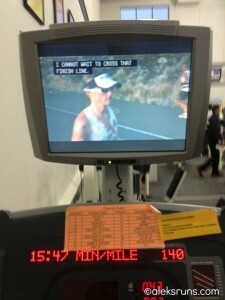 While on the dreadmill, I like to catch up on tv shows, listen to audiobooks or, my favorite, listen to music! I try to read but I lack the required amount of coordination.